A crocodile was spotted on Hollywood Beach and authorities responded quickly. NBC 6's Jamie Guirola reports. A 6-foot crocodile was spotted sun bathing on a Florida beach Monday morning, drawing dozens of onlookers as it sat in the surf. Police responded to Hollywood Beach near N. Surf Road and Haynes Street after witnesses reported seeing the crocodile walking along the shore around 7:30 a.m.
Officials said marine patrol earlier saw the crocodile near the Dania Beach Pier. 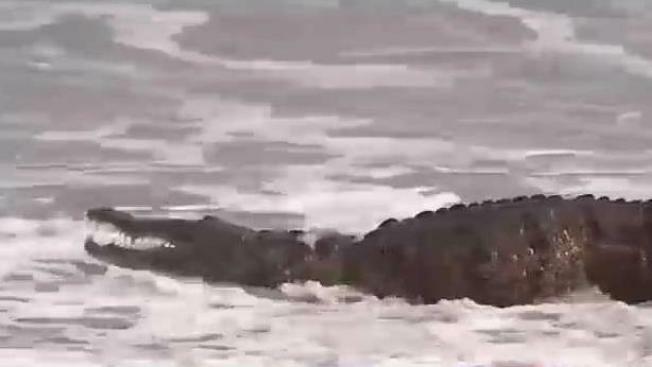 Video footage showed the croc lying on the shore line, its head facing toward the sky as waves rolled over its body. At one point it moved further into the water before returning above the surf. Florida Fish and Wildlife Conservation Commission officers responded to the scene as Beach Safety officials kept beachgoers and onlookers away from the animal. Officers were eventually able to capture the croc on the beach.